As one of the most seasoned fencing contractors serving the residential and commercial needs of the Greater Los Angeles area for over 35 years, the specialists at J&J Vinyl Fence are skilled at constructing long-lasting automated and manual vinyl gates at the best values around. Our vinyl gates are custom-built to perfectly complement a corresponding fence and the surrounding property. As fencing experts, no vinyl gate is too complicated for us to construct. If you are looking for added automation or security, we use the most up-to-date technology for our custom automated vinyl gates. At J&J Vinyl Fence we have the experience and expertise to create a beautifully elegant vinyl gate that is capable of handling heavy usage and foot traffic. Our superior craftsmanship ensures a gorgeous finished look and smooth functionality. 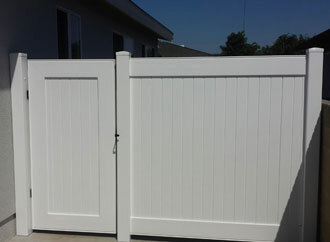 Vinyl gates come in a variety of coordinating colors and can feature post-caps or other enhancements. We can even wrap a traditional steel gate in vinyl to give it a natural look with added stability, or complement a traditional wooden fence with a customized vinyl lattice arbor entryway. Like our vinyl fences, vinyl gates require minimal maintenance as they resist fading, blistering, warping, flaking, and corrosion. Manual vinyl gates are built with premium quality hardware, such as hinges, latches, handles, and locks. Automated vinyl gates feature innovative and reliable automated gate systems from trusted manufacturers, such as Viking, Doorking, and Elite. Gate system options include security access control systems, electronic operators, and motorized systems that can be modified to sync with your Smart Device, keypad, or remote transmitter. Many of our motorized gates come with back-up batteries and are built to-code with transporters that are programmed to open once you come within close proximity to your gate. Call Today for a Free Vinyl Gate Estimate. First-Time Customers Receive a 10% Discount. J&J Vinyl Fence is a family-owned and -operated fencing contractor that is licensed, bonded, and insured. All our work is done in-house and without the use of subcontractors. We pledge to build a truly customized vinyl gate that coincides with your budget, preferred style, and desired functionality. Our manual and automated vinyl gates are all backed by manufacturer warranties: transferable limited lifetime warranties on all vinyl and extensive warranties on all hardware and motorized devices. We know you have multiple options when choosing a vinyl fencing contractor, and we look forward to realizing your customized vinyl gate.